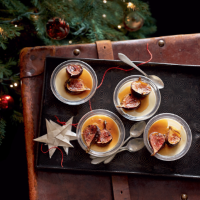 You can get ahead by making the panna cottas up to three days before you need them, then just roast the figs a couple of hours before serving. 1. Lightly brush the insides of 8 pudding moulds (150-175ml) with oil and set aside. Place the cream, milk, 130ml of the maple syrup, half the vanilla seeds and half the split vanilla pod in a saucepan and warm through. Remove from the heat before the mixture boils and set aside for 20 minutes. 2. Soak the gelatine leaves in cold water for 5 minutes to soften. Return the cream mixture to the heat, again removing the pan just before the mixture boils (or the cream may curdle). Immediately squeeze the excess water out of the gelatine and whisk it into the hot cream, followed by the crème fraîche and 20ml of the rum or juice. Pour into the moulds, cover with clingfilm and leave to cool then chill for at least 4 hours or up to 3 days before serving. 3. Prepare the figs up to 2 hours ahead of serving. Preheat the oven to 180°C, gas mark 4. Put the figs in an ovenproof dish, cut sides up. Combine the remaining vanilla seeds with the remaining 70ml maple syrup and 90ml rum and spoon over the figs. Tuck the half vanilla pod in, dust with the Signature Spice and dot with the butter. Cover the dish with foil and roast for about 20 minutes, then remove the foil and cook for 5 minutes more until the figs are soft but still hold their shape. Set aside to cool slightly. 4. Top each pannacotta pot with some of the figs and their cooking liquor.